The ongoing drought and famine afflicting Somalia and other East African nations is “a humanitarian crisis that cries out for help to Christians throughout the world,” said the president of the U.S. Conference of Catholic Bishops and the chairman of the board of Catholic Relief Services in a joint statement. Baltimore-based CRS, the U.S. bishops’ overseas aid and development agency, estimates that more than 12 million people are in urgent need of aid in Kenya, Somalia and Ethiopia. 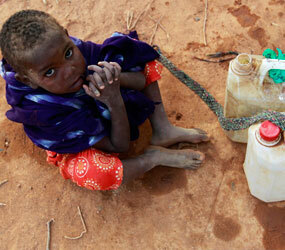 The drought has resulted in failed crops, deaths of livestock and critical shortages of food and water. “There are parents whose little children have died, and children who have been orphaned. They are suffering from hunger, thirst, disease and drought,” the prelates said in a statement issued from Baltimore, home to CRS headquarters. “We see millions of people being forced from their homes, leaving behind what meager possessions they had, and walking for days over rough terrain” to find sustenance. In Ethiopia, CRS officials said the agency is expanding its food distribution program to 1.1 million people and is working with local partners to provide livelihood support, water and sanitation. In Somalia, CRS is supporting local partners to assist highly vulnerable, displaced families with basic necessities, such as food packages, support to clinics, therapeutic feeding and shelter. In Kenya, CRS is working both to assist newly arrived refugees with hygiene, sanitation promotion and protection, and also to provide water, sanitation and supplemental feeding to drought-affected Kenyan communities. The U.S. government announced Aug. 8 it will give an additional $105 million in humanitarian assistance to nations in the Horn of Africa region, bringing its total commitment for this fiscal year to $564.5 million to help those in need. The money is being used for health, nutrition, agriculture and food security, economic recovery, humanitarian coordination, community-based education and anti-malnutrition measures, and water, sanitation and hygiene initiatives in Ethiopia, Somalia and Kenya. Editor’s Note: The following international aid agencies are working with partner agencies and local religious leaders in eastern Africa and are accepting donations for refugees affected by the region’s drought and famine. – Catholic Relief Services is accepting donations by phone at (800) 736-3467; online at http://crs.org; or by mail to CRS, P.O. Box 17090, Baltimore, MD 21203-7090. – Jesuit Refugee Service is accepting donations by phone at (202) 629-5948; online at www.jrsusa.org; or by mail to JRS, 1016 16th St. N.W., Suite 500, Washington, DC 20036. – The United Nations High Commissioner for Refugees is accepting donations online at www.unhcr.org.